If you are not familiar with small-angle scattering, this may be a good place to start. update: check out this review paper, which discusses most aspects of SAXS data collection, all possible data correction steps and has a few remarks on the subsequent data fitting steps. Besides this introductory text, there is also a good write-up here, which is a little more in-depth and expansive. Welcome to small-angle scattering. 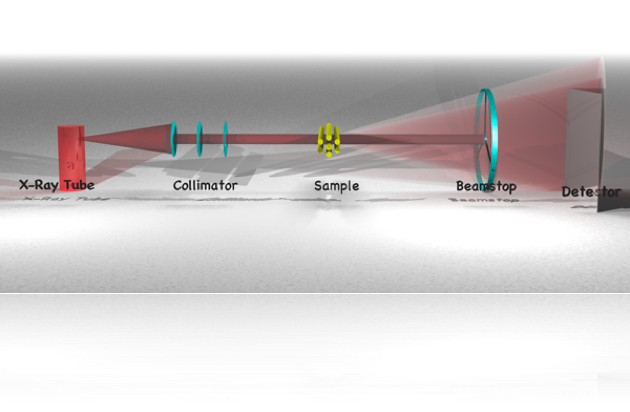 Techniques such as light scattering (LS), small-angle x-ray scattering (SAXS) and small-angle neutron scattering (SANS) are all small angle scattering techniques. These techniques are used to analyse the shape and size of objects much smaller than can be seen by eye, by analysing the way that radiation (light, x-rays or neutrons) is scattered by the objects. The sizes we are talking about range from 1 micrometer to several angstrom (1 angstrom is 1x10^-10 meters, or 0.0000000001 meter). Unlike microscopic techniques, in small-angle scattering, the smaller the size, the easier it is to measure. There are other marked differences with microscopy, which will be discussed after explaining what the technique is. All aforementioned scattering techniques operate on the principle of wave interference when contrasting features are encountered in the sample. No photon energy loss is assumed in most cases, so that all scattering effects can be considered purely elastic. And can be treated as a pure wave-interference effect. For the technique to work, a beam of parallel ‘light’ is shone upon a sample. Small contrasting features cause a fraction of the light to deviate from its path, thus scattering. This scattered light is then collected on an angle-discriminating detector. As mentioned, scattering occurs when contrasting features are present. This has implications to the type of samples that can be measured. Among the samples that can be analysed with small-angle scattering are proteins in solution, polydisperse particles, pore structures and density differences in single-phase samples. What is important is that there is a contrast between the particle or pore, and the surrounding material in the sample. The type of contrast varies depending on the type of radiation used. In small-angle x-ray scattering this is an electron density contrast, for small-angle neutron scattering this is a neutron scattering cross-section, and for small-angle light scattering this is a transmittance contrast. This difference in contrast type means that if there is a contrast problem while measuring a sample with one technique (i.e. too little or too much contrast), by switching to a different radiation type you may be able to solve your problems. Like its sister technique, diffraction, small-angle scattering charcterises lengths in a sample. Simply said, small objects scatter a little to larger angles, and large objects scatter a lot to small angles. Since the scattering behaviour is highly dependent on the lengths in the sample, this length information can (in most cases) be retrieved. A variety of analysis methods can be used to interpret the scattering behaviour. These analysis methods revolve around a mathematical construct known as the Fourier transform. Effectively, the scattering can be calculated as the Fourier transform of the real-space structure. In other words, a measurement is a physical Fourier transform of your sample. Unfortunately, most detectors can only measure the intensity of the Fourier transform, and not its complementary phase information, and thus vital information is lost, complicating data interpretation. A marked differences from diffraction techniques is that the small-angle scattering pattern does not contain much information. Indeed, without information on the sample morphology obtained from other techniques such as microscopy, the small-angle scattering information is open to a multitude of interpretations (technically, this is true of diffraction as well, but methods have been developed to get around this problem for some diffraction data). So why would we choose to use this technique as opposed to, say, microscopic methods? But if you talk to microscopists, you will find that one of the bigger challenges in the successful application of microscopy lies in the sample preparation. The further down you want to go in size, the more complex the preparation can become, and many (soft) samples can therefore not be measured properly. The sample preparation method may also induce a structure in the sample, for example due to stresses imposed during cutting, grinding or polishing. This can make it difficult to distinguish the sample structure from the induced artefacts. But even if the sample preparation is done perfectly, you can only observe a small fraction of the complete sample at a time. In order to get a good statistical average, you need to prepare many samples and measure each sample at multiple locations. This is far from impossible, but it makes you start to think if there would be another solution to your problem. Finally, if you are interested in observing your sample in-vivo or in-situ, e.g. under reaction conditions or high pressure, microscopic techniques ofen fail to offer solutions. With small-angle scattering, these problems are substituted for others (which we will come to in a minute). Firstly, small-angle scattering requires only very little, if any, sample preparation. Liquid samples can be measured in capillaries, for example, and fibre samples can be measured simply by suspending the fibre in the beam. Many in-situ reactors can also be used so that reactions can be probed as they proceed. An additional benefit is that the information present in the scattering pattern pertains to all objects in the irradiated volume. This means that if you want to get an average particles parameter over billions of particles in a suspension, all you need to do is make sure the irradiated sample volume is large enough to contain a billion particles. In small-angle x-ray scattering, volumes of about one to several cubic millimeters are commonly probed. For neutron scattering techniques, this irradiated volume is usually a cubic centimeter or more! So there are certainly advantages of using small-angle scattering methods over microscopes methods, yet microscopes dominate laboratories. Why is that? That is related to the challenges of analysis of small-angle scattering patterns, and the challenges of collecting a good scattering pattern. Please excuse my focus in this case on x-ray scattering, it is simply the form of scattering I am most familiar with. Some challenges, but not all, of x-ray scattering can be translated to the other scattering techniques. There are many fine details about the challenges of SAXS. Besides the challenges of collecting a near-perfect scattering pattern (which in many cases can be overcome through hard work and understanding), the main issue lies with the data analysis. If you have managed to collect the perfect background-subtracted scattering pattern in the right angular region on an absolute scale with uncertainties for each data point, the road ahead may still be unclear. The problem lies mainly in the ambiguity of the data, which has become ambiguous since we have lost information in the scattering process (as we have detected only the scattering intensity and have lost the phase information of the Fourier transform). The most clear example of this loss is that particle shape and polydispersity can no longer both be retrieved. This is another important concept in scattering; you can only determine the polydispersity if you know the particle shape, and you can only determine the particle shape if you have information on the polydispersity (for example if you have a monodisperse sample of proteins in solution, or if you have information on the distribution shape). This means experimentally that, in order to get convincing results of your SAXS data analysis, you need complementary microscopy information. Even with all the information, data fitting is difficult at best. In short then, the technique is still (a hundred years after conception) in dire need of development, mostly in terms of data analysis. This weblog aims to collect some of the information on the web for other users and developers, and adding a bit more of my own research, in the hope that we can get closer to making small-angle scattering easy. Thanks for sharing the information. Also, do you know how to analyze the SAXS data? I am wondering about a method to find partical sizes and structures? There are methods for determining particle sizes and structures, but you can only determine one of them with SAXS. To be more precise, you can only determine one of the following, you have to know the other two: Size distribution, shape, packing. As soon as you know two (from microscopy, for example) you can determine the third. There is some more work coming later about data analysis, but that will take some more time. Are you using a Mac to make your presentations, such as the one on SAXS? In my research i use SANS measurments, do you know how can i obtain the scattering length density profile ? (Psld(r)) ? At first, thanks for sharing your knowledge. I’m still trying to learn about SAXS and I can say that your website helps me a lot! In my research I will have to identify some precipitates (from 1 to 20 nanometers in size) in a steel. I’m sure I’ll have to use TEM at this analysis too. I’d like to know if it’s possible to discover about volume fraction of a precipitate and if is there any problem if I have two (or more) kinds of precipitate at the same time on sample? Also, do you have any material talking about sample preparation for SAXS? Thanks for the positive words about the website. I’m very happy that it manages to convey some information. As for your question, I think your precipitate size should be no problem (especially if they are spherical). SAXS will give you good information on the (volume-weighted) size distribution and volume fraction in particular. However, as you indicate, multiple species can add to the complexity. In SAXS, you will see a superposition of all nanostructural features in your sample, and it is up to you to pick this apart again if necessary. Depending on the precipitates, the two species may be occupying different size ranges (in which case you can separate them nicely). If this is not the case, you may be able to estimate their ratio from TEM, and then plug that information into your SAXS analysis. So the essence of the story is: the more complex your system is, the more information you need to plug into it to get a sensible answer. There are workarounds. If one of your precipitate species contains an element not found in the other, and if you are lucky, you can use ASAXS (anomalous SAXS) to isolate the scattering from that element. Thereby you can selectively analyse one species alone. Anyway, I hope this helps a bit. If you need more information, feel free to contact me again! Many thanks for your interesting blog. Way to go! Please, I would like to ask which would be the limit for the harmonic content tolerable in SAXS measurements, maybe different for different types of samples? And whether available SAXS softwares are able to take the harmonic content into account.